Bliss-Stick – Made in New Zealand by some hard-core kayakers. 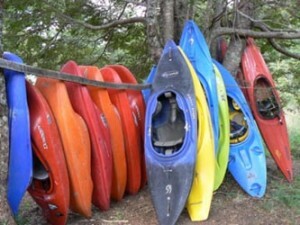 Their kayaks have cool names like Rad, Scud, and Mystic. Dagger – Owned by the larger company Confluence Watersports in South Carolina, Dagger’s line of whitewater kayaks include the Nomad, Mamba, RPM, Kingpin, Agent and RX. Jackson Kayak – Made by world champion kayaker, Eric Jackson, and heralded as the only company making good kids kayaks these days, Jackson boats are well-designed and have simple outfitting. Their fleet includes the All-Star, Hero, Rocker, Fun, and Dynamic Duo. Liquid Logic – Hailing from North Carolina, Liquid Logic boats are known for having super comfy, lazy boy-like outfitting. Their Jefe series is a great creeker and they recently came out with a new playboat, the Bisquit, in 2009. Necky – A lot of people out there say that some Necky boat or another was their first. Now they only make 2 whitewater kayaks, so you don’t see them on the water quite so much. Pyranha – Offering too many kayak options to list here, their more well-known ones are the Inazone, Burn, Habitat, Everest, and Rev. They are based out of North Carolina and England.